Heat shock protein 90 (Hsp90), a chaperone that regulates activity of many client proteins responsible for cellular growth, differentiation, and apoptosis, has been proposed as an important clinical and preclinical therapeutic target in a number of malignancies and autoimmune diseases, respectively. In this study, we evaluated the effects of pharmacological Hsp90 inhibition on human proinflammatory T cell responses. Using anti-CD3 antibody-stimulated human peripheral blood mononuclear cell cultures, we observed that Hsp90 inhibition by non-toxic concentrations of the geldanamycin derivative 17-DMAG significantly blocked T cell proliferation, reduced IFN-γ and IL-17 expression on CD4+ T lymphocytes, and arrested secretion of proinflammatory IFN-γ, TNF-α, and IL-17, cytokines characteristic of Th1 and Th17 cells, respectively. These effects were associated with inhibition of NF-kB activity, upregulation of Hsp70 protein expression, and disruption of T cell-specific nonreceptor tyrosine kinase Lck activation. Our results further support the potential use of Hsp90 inhibitors in patients with autoimmune diseases where uncontrolled Th1 or Th17 activation frequently occurs. Heat shock protein 90 (Hsp90) is an ATP-dependent molecular chaperone that is exploited by malignant cells to support activated oncoproteins, including many cancer-associated kinases and transcription factors, but has been also shown to exert potent immunomodulatory actions[1, 2]. Several pieces of evidence show that Th1 and Th17 cells are pathophysiologically associated with several autoimmune diseases and that Hsp90 activity is required for IFN-γ and IL-17 signaling in these cell types, respectively[3–5]. Based on these findings and the observations that Hsp90 plays important roles in antigen presentation, activation of lymphocytes, macrophages, and dendritic cells, we and others claim that pharmacological inhibition of Hsp90 is a promising therapy to ameliorate inflammatory cascades in autoimmune diseases[6–11]. In the present study, we show that blockade of Hsp90 by the geldanamycin derivative 17-DMAG leads to inhibition of T cell proliferation, suppression of IFN-γ and IL-17 expression on CD4+ T cells, and attenuation of secretion of proinflammatory IFN-γ, TNF-α, and IL-17, cytokines characteristic of Th1 and Th17 cells, respectively. Peripheral blood mononuclear cells (PBMCs) were isolated from venous blood of 11 healthy volunteers (age 25-35 years, mean 29.72 ± 3.47, 6 females and 5 males) by Ficoll-Paque (GE Healthcare Bio-Sciences) gradient centrifugation and cultured as described previously with minor modification. Briefly, PBMCs were washed twice in PBS and resuspended at 0.5 × 105 or 1 × 106 cells per ml of medium (RPMI 1640 supplemented with 10% fetal calf serum, 2 mM L-glutamine, and penicillin/streptomycin). Cells were cultured in the presence of 1 μg/ml immobilized anti-CD3 mAb (BD Bioscience) in 24-well or 96-well culture plates in 5% CO2 at 37°C without or with different concentration of 17-DMAG (InVitrogen) for 24 hours, 72 hours, or 7 days. The collection of blood samples was approved by the Ethics Committee of the University of Lübeck, and informed consent was obtained according to the Declaration of Helsinki. Cytotoxicity of 17-DMAG was measured by a lactate dehydrogenase (LDH)-releasing assay using a Cytotoxicity Detection Kit (Roche) according to the manufacturer’s protocol and quantified using an ELISA plate reader. Briefly, PBMCs (1 × 106 per ml) were incubated with 17-DMAG at different concentrations (0.1, 1, and 2.5 μM) for 24 hours. Cell lysis was determined by measuring the amount of LDH released into the culture medium. A total of 0.5 × 105 PBMCs were cultured in the presence of plate-bound anti-CD3 mAb in 96-well plates. Stimulated cells were cultured alone or with different concentrations of 17-DMAG (0.1, 1, or 2.5 μM). After 6 days, cells were pulsed with BrdU for further 24 hours. T cell proliferation was measured using a colorimetric cell proliferation BrdU ELISA (Roche). For analysis of intracellular cytokines, PBMCs were stimulated with anti-CD3 mAb without or with 17-DMAG (0.1 μM) for 72 h hours. A GolgiStop™ Protein Transport Inhibitor (BD Pharmingen™) was added together with phorbol-12-myristate-13-acetate (PMA) (50 ng/ml) and ionomycin (1 μg/ml) (Sigma) for the last 5 hours. Cells were washed, fixed, permeabilized, and stained for detection of intracellular cytokines using the following anti-human mAbs: anti-IFN-γ-FITC, anti-IL-17-PE, and anti-CD4-PERCP-CY5.5 (BD Pharmingen). Samples were analyzed using FACSCalibur flow cytometer (BD). Supernatants of PBMC cultures were collected after a 72-hour treatment period with anti-CD3 mAb in absence or presence of 17-DMAG (0.1 μM). Supernatants were taken from cultures non-treated by GolgiStop, PMA, or ionomycin. Twelve cytokines (IL-2, IL-4, IL-5, IL-6, IL-10, IL-12, IL-13, IL-17A, IFN-γ, TNF-α, G-CSF, and TGF-β1) were measured by a Human Th1/Th2/Th17 Cytokines Multi-Analyte ELISArray Kit (Qiagen Biosciences). For analysis of NFκB p65 activity, PBMCs were stimulated with anti-CD3 mAb without or with different concentrations of 17-DMAG (0.1, 1, and 2.5 μM) for 24 hours. NFκB p65 activity was measured in cell lysates by a NFκB p65 ELISA kit following the manufacturer’s instruction (Enzo). Equal amounts of PBMC lysates were separated by 10% SDS-PAGE gel and transferred onto nitrocellulose membrane. The membrane was blocked with 3% milk in PBS for 2 hours, followed by incubation with rabbit polyclonal antibodies against NFκB p65 (1:1000; Santa Cruz Biotechnology, Inc.), Hsp70 (1:100; Stressgen), p-Lck (Tyr394) (1:1000; Sigma), and β-actin (1:1000; Cell Signaling Technology) at room temperature for 2 hours. Horseradish peroxidase-conjugated gout anti-rabbit antibodies (1:1000; Dako) were used as secondary antibodies. The bands were visualized using Amersham ECL Plus Western Blotting Detection Reagents (GE Healthcare). Relative NFκB p65, Hsp70, and p-Lck (Tyr394) protein concentrations were measured by densitometry. Data was analyzed by Student’s t-test or one-way analysis of variance (ANOVA) using Graphpad prism 5 (San Diego, California). A P-value <0.05 was considered to indicate a statistically significant difference. To determine whether 17-DMAG affects T cell proliferation, we isolated human PBMCs from healthy volunteers and stimulated them with anti-CD3 antibody in the absence or presence of different amounts of 17-DMAG. Cell proliferation was assayed by BrdU ELISA. T cell proliferation was inhibited by 17-DMAG in a dose-dependent manner (Figure 1A) and this inhibitory effect was observed upon non-toxic concentrations of the inhibitor (Figure 1B). 17-DMAG inhibits proliferation of T cells. A Proliferation response of human PBMCs stimulated by plate-bound anti-CD3 antibody (1 μg/ml) in absence and presence of 17-DMAG. Cell cultures were exposed to different concentrations of 17-DMAG and proliferation was assayed by ELISA after BrdU incorporation on the 6th day of treatment followed by 24 hours incubation. B LDH-based cytotoxicity ELISA measurement in culture medium after 24-hour incubation of PBMCs with different concentrations of 17-DMAG. LDH release from cells lysed with 1% Triton X-100 was regarded as 100%. The results are presented as mean values ± SEM of n = 4 healthy blood donors. *P < 0.05. 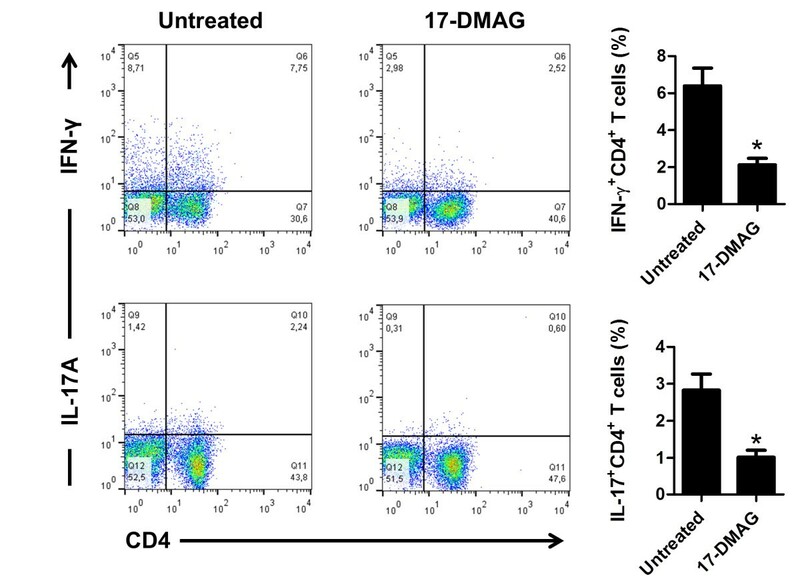 Next, we investigated the effects of 17-DMAG on proinflammatory T cell subpopulations [CD4+IFN-γ+ (Th1) and CD4+IL-17+ (Th17)] using flow cytometry. We observed that 17-DMAG significantly inhibited intracellular expression of IFN-γ and IL-17A in anti-CD3 antibody-treated PBMCs, representing Th1 and Th17 cell fractions, respectively (Figure 2). 17-DMAG reduces frequencies of proinflammatory Th1 and Th17 cell subpopulations. PBMCs were stimulated with 1 μg/ml of plate-bound anti-CD3 antibody in absence or presence of 17-DMAG (0.1 μM) for 72 hours. GolgiStop™, PMA, and ionomycin were added in the last 5 hours of culture before permeabilization. Cells were washed, stained with anti-CD4, anti-IFN-γ, and anti-IL-17 antibodies, and analyzed by flow cytometry. The numbers in upper right quadrants of the representative dot blots show the percentage of positive cells of each CD4+ T cell subpopulation. The results are presented as mean values ± SEM of n = 4 healthy blood donors. *P < 0.05. Using ELISA, we further measured the effects of 17-DMAG on secretion of a broad array of PBMC-derived cytokines (IL-2, IL-4, IL-5, IL-6, IL-10, IL-12, IL-13, IL-17A, IFN-γ, TNF-α, G-CSF, and TGF-β1). The cytokines were assayed in culture medium of PBMCs stimulated with anti-CD3 antibody. 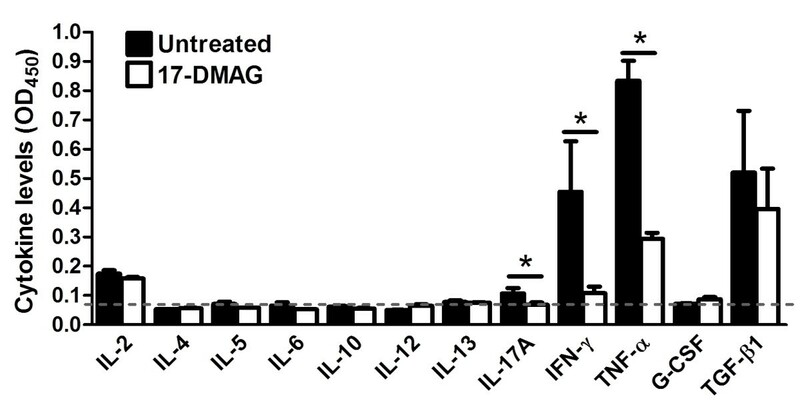 The presence of 17-DMAG significantly inhibited the secretion of the proinflammatory cytokines IFN-γ (4.2-fold), TNF-α (2.8-fold), and IL-17A (1.5-fold). 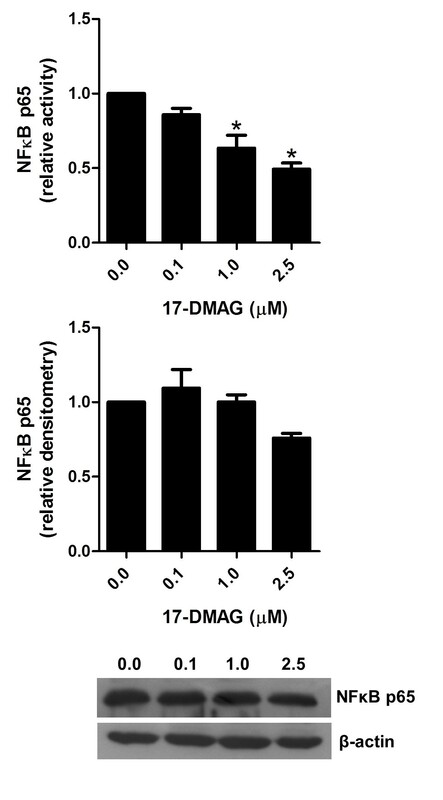 We found no significant influence of 17-DMAG on IL-2, G-CSF, and TGF-β1 secretion. The remaining cytokines were below the detection limit of the assay (Figure 3). 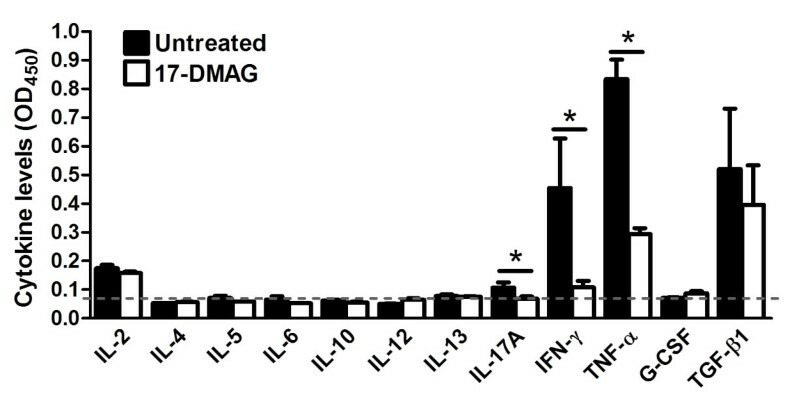 17-DMAG arrests secretion of proinflammatory cytokines. ELISA-based evaluation of the cytokines IL-2, IL-4, IL-5, IL-6, IL-10, IL-12, IL-13, IL-17A, IFN-γ, TNF-α, G-CSF, and TGF-β1 secreted into the culture medium by PBMCs which were stimulated with 1 μg/ml plate-bound anti-CD3 antibody and treated without or with 17-DMAG (0.1 μM) for 72 hours. The results are presented as mean values ± SEM of n = 3 healthy blood donors. The dotted line represents the mean detection limit of the assay. *P < 0.05. To test whether Hsp90 inhibition had an impact on NFκB p65, its activity as well as protein expression was measured in cell lysates of anti-CD3 antibody-stimulated PBMCs by ELISA and immunoblotting, respectively. Our results revealed that the addition of 17-DMAG dose-dependently suppressed NFκB p65 activity without affecting its protein level (Figure 4). 17-DMAG blunts NF κB p65 activity. Analysis of NFκB p65 in PBMCs stimulated with 1 μg/ml plate-bound anti-CD3 antibody in absence and presence of different concentrations of 17-DMAG for 24 hours. NFκB p65 activity and protein expression was analyzed in lysates of these cell cultures by ELISA and immunoblotting, respectively. Protein concentration was expressed relative to the β-actin level using densitometry measurements. The results are presented as mean values ± SEM of n = 3 healthy blood donors. *P < 0.05. To investigate whether 17-DMAG influenced the expression of Hsp70, a common marker of Hsp90 inhibition, immunoblot analysis of lysates from anti-CD3 antibody-stimulated PBMCs was performed. 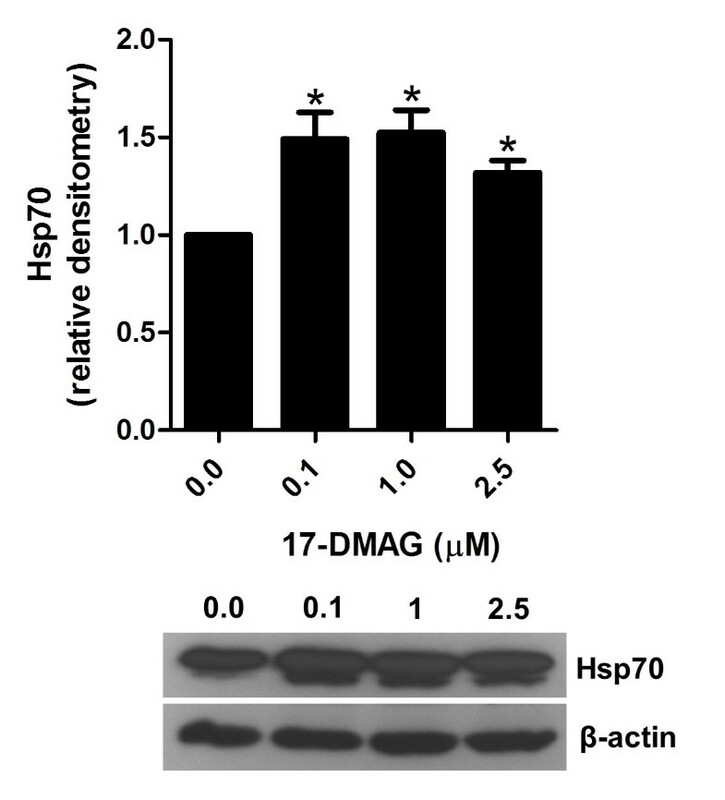 Indeed, the addition of 17-DMAG to these cell cultures resulted in induction of Hsp70 protein expression (Figure 5). 17-DMAG induces Hsp70 expression. Analysis of Hsp70 in PBMCs stimulated with 1 μg/ml plate-bound anti-CD3 antibody in absence and presence of different concentrations of 17-DMAG for 24 hours. Hsp70 protein expression was analyzed in cell lysates of these cell cultures by immunoblotting. Protein concentration was expressed relative to the β-actin level using densitometry measurements. The results are presented as mean values ± SEM of n = 3 healthy blood donors. *P < 0.05. To examine whether Hsp90 inhibition had an impact on T cell-specific nonreceptor tyrosine kinase Lck, its phosphorylation status was measured in cell lysates of anti-CD3 antibody-stimulated PBMCs by immunoblotting. 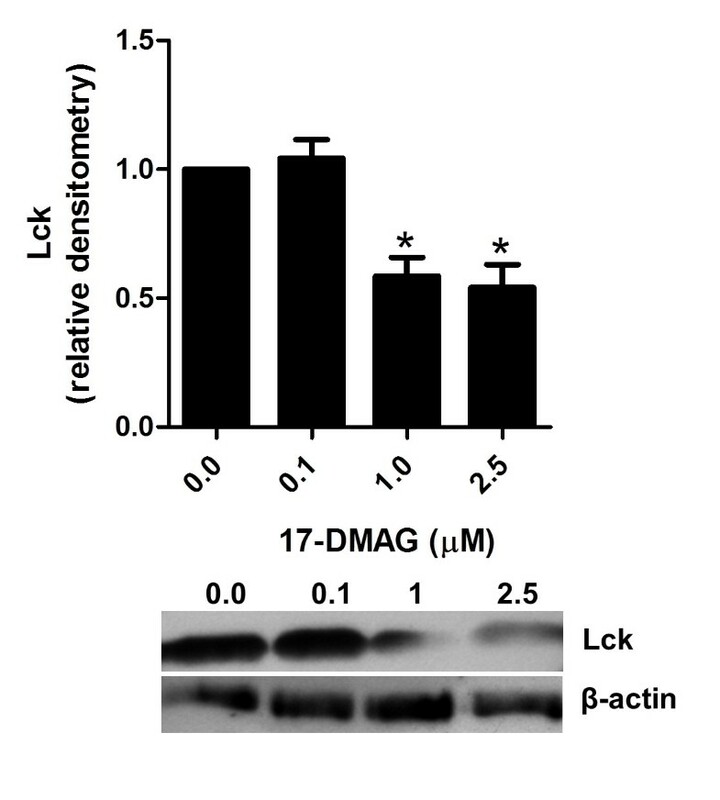 We demonstrated that the addition of 17-DMAG dose-dependently suppressed Lck activation (Figure 6). 17-DMAG disrupts Lck activation. Analysis of Lck in PBMCs stimulated with 1 μg/ml plate-bound anti-CD3 antibody in absence and presence of different concentrations of 17-DMAG for 24 hours. Lck phosphorylation at Tyr394 position was analyzed in lysates of these cell cultures by immunoblotting. Protein concentration was expressed relative to the β-actin level using densitometry measurements. The results are presented as mean values ± SEM of n = 3 healthy blood donors. *P < 0.05. Here, we provide evidence that 17-DMAG, upon non-toxic concentrations, inhibited T cell proliferation and reduced percentages of Th1 and Th17 cells, which was associated with dampened Th1 (IFN-γ and TNF-α) and Th17 (IL-17) cytokine secretion. These results are in good agreement with previous studies reporting the capacity of Hsp90 blockers to inhibit proliferation of T lymphocytes ex vivo and to downregulate these proinflammatory T cell subtypes[4–11, 13]. Since Th1 and Th17 cells are essential to the development of various autoimmune diseases, treatment strategies which aim at blocking of uncontrolled activation of such effector cell populations are highly warranted. In fact, pharmacological blockade of Hsp90 has been reported to be an effective treatment in rodent models of T cell-mediated autoimmune diseases, such as autoimmune encephalomyelitis, rheumatoid arthritis[7, 8], and systemic lupus erythematosus[9, 10]. In addition, our research group recently demonstrated that, by downregulating T cell responses, treatment with Hsp90 inhibitors is also effective in mice with the experimentally induced autoimmune bullous disease epidermolysis bullosa acquisita. Although the main focus of our experiments was to study the impact of 17-DMAG on Th1 and Th17 subpopulations, we cannot rule out but also not support that 17-DMAG additionally exhibited suppressive activity on other T cell populations such as Th2 and regulatory T cells since Th2 cytokines released from anti-CD3 antibody-stimulated PBMCs were below the detection limit of our assay and secreted IL-10 and TGF-β1, cytokines associated with regulatory T cell function, were also undetectable or not significantly inhibited in our study, respectively. In this context, it is worth noting that there is evidence in the recent literature that Hsp90 inhibition can promote rather than inhibit regulatory T cells, further supporting an antiinflammatory mechanism of action of Hsp90 blockers in terms of T cell responses[14, 15]. 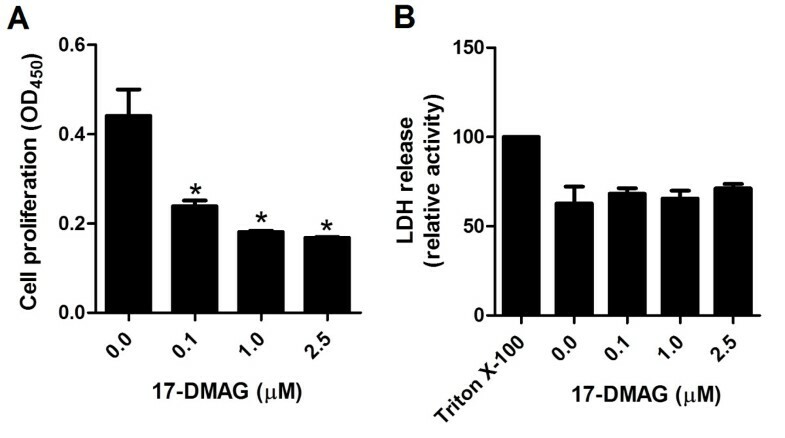 Our current experiments further revealed that inhibition of T cells by 17-DMAG was associated with deactivation of NFκB and upregulation of Hsp70. While NFκB is a client of Hsp90 and one of the major transcription factors responsible for proliferation of T cells and their proinflammatory IFN-γ and IL-17 expression[16, 17], Hsp70 is generally considered as a marker for effective Hsp90 inhibition and also regarded as potent antiinflammatory chaperone capable of inhibiting NFκB signaling pathways[18–20]. Corticosteroids, which are widely used to treat patients with autoimmune diseases, mediate their immunosuppressive effects through cytosolic ligand-inducible glucocorticoid receptors. Inactive glucocorticoid receptors are associated with (co)chaperones, including Hsp90, which dissociate after their ligation, followed by nuclear translocation of these receptors and regulation of gene transcription. The glucocorticoid receptor has been described as part of a T cell receptor-linked multiprotein complex containing Hsp90 and the nonreceptor tyrosin kinases Lck and Fyn, which is essential for T cell receptor-dependent Lck/Fyn activation. It has been previously shown that either treatment with dexamethasone or knocking down Hsp90 by Hsp90siRNA induces dissociation of this protein complex, resulting in abrogated T cell receptor signaling as a consequence of impaired Lck/Fyn activation. Similar to this and other previous studies[4, 13, 22], we could show in the current experiments that pharmacological blockade of Hsp90 was associated with inhibition of Lck activation in anti-CD3 antibody-stimulated PBMCs, a mechanism that could further account for the observed immunosuppressive effects of this treatment on T cells. Considering that inhibition of both NF-kB function and proximal T cell receptor signaling by corticosteroids can be mimicked using Hsp90 inhibitors and that a novel generation of Hsp90 blockers with good tolerability has been reported in the field of cancer treatment[4, 13, 22–25], it remains to be clarified in the future whether this class of drugs can potentially represent an effective alternative for corticosteroid therapy with a better side effect profile in patients with autoimmune diseases. Together, our results further support the potential use of Hsp90 inhibitors in patients with autoimmune diseases where inappropriate activation of proinflammatory Th1 and Th17 subpopulations frequently occurs. This work was supported by Deutsche Forschungsgemeinschaft (DFG) Excellence Cluster “Inflammation at Interfaces” (EXC 306/2), DFG KA 3438/1-1, Medical Faculty of the University of Lübeck (E22-2013), and Focus Program “Autoimmunity” at the University of Lübeck. ST conceived the study, designed experiments, performed research, analyzed data, and wrote the manuscript. DZ analyzed data and contributed to composition of the paper. MK helped conceive of the study, design experiments, and write the manuscript. All authors read and approved the final manuscript.